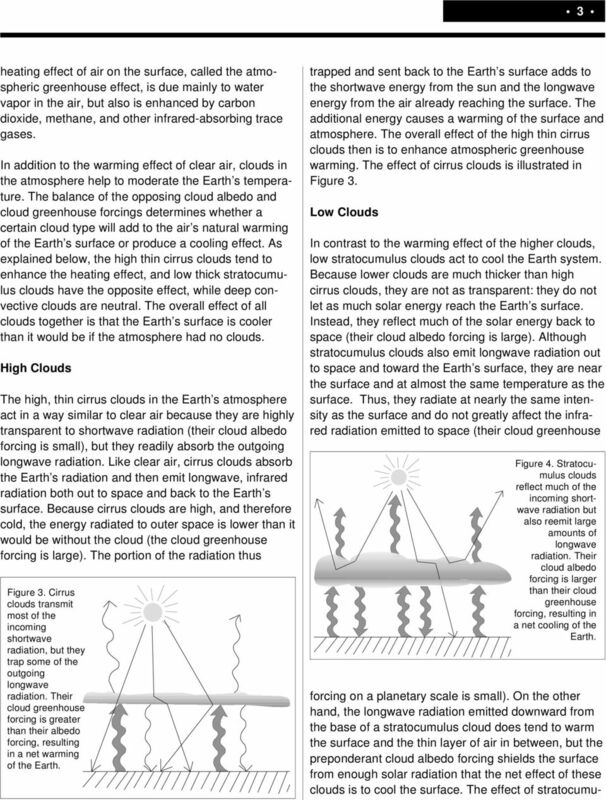 Download "Clouds and the Energy Cycle"
4 4 lus clouds is illustrated in Figure 4. Deep Convective Clouds In contrast to both of the cloud categories previously discussed are deep convective clouds, typified by cumulonimbus clouds. A cumulonimbus cloud can be many kilometers thick, with a base near the Earth s surface and a top frequently reaching an altitude of 10 km (33,000 feet), and sometimes much higher. 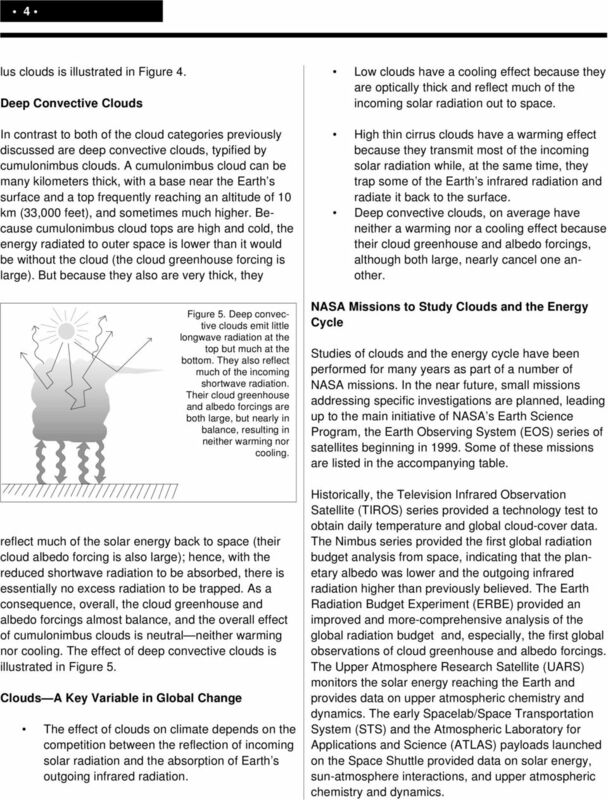 Because cumulonimbus cloud tops are high and cold, the energy radiated to outer space is lower than it would be without the cloud (the cloud greenhouse forcing is large). But because they also are very thick, they Figure 5. Deep convective clouds emit little longwave radiation at the top but much at the bottom. They also reflect much of the incoming shortwave radiation. Their cloud greenhouse and albedo forcings are both large, but nearly in balance, resulting in neither warming nor cooling. reflect much of the solar energy back to space (their cloud albedo forcing is also large); hence, with the reduced shortwave radiation to be absorbed, there is essentially no excess radiation to be trapped. As a consequence, overall, the cloud greenhouse and albedo forcings almost balance, and the overall effect of cumulonimbus clouds is neutral neither warming nor cooling. The effect of deep convective clouds is illustrated in Figure 5. 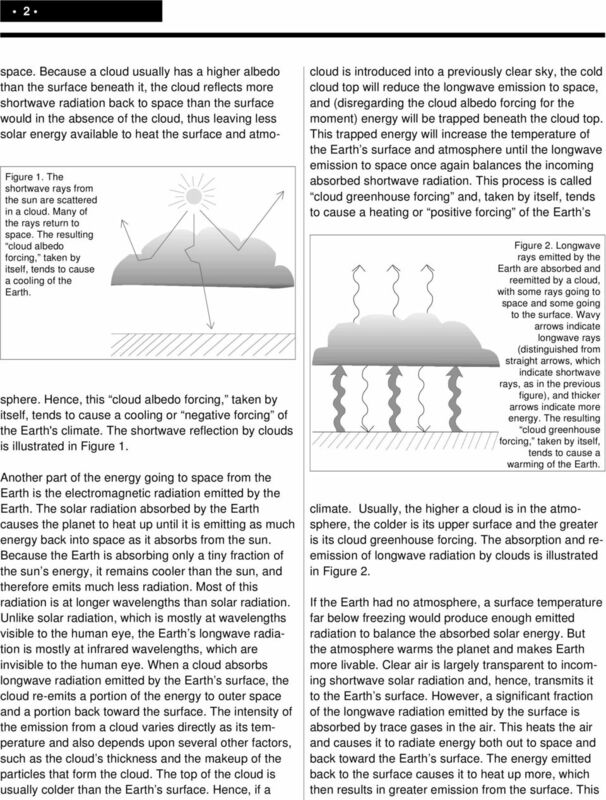 Clouds A Key Variable in Global Change The effect of clouds on climate depends on the competition between the reflection of incoming solar radiation and the absorption of Earth s outgoing infrared radiation. Low clouds have a cooling effect because they are optically thick and reflect much of the incoming solar radiation out to space. High thin cirrus clouds have a warming effect because they transmit most of the incoming solar radiation while, at the same time, they trap some of the Earth s infrared radiation and radiate it back to the surface. Deep convective clouds, on average have neither a warming nor a cooling effect because their cloud greenhouse and albedo forcings, although both large, nearly cancel one another. 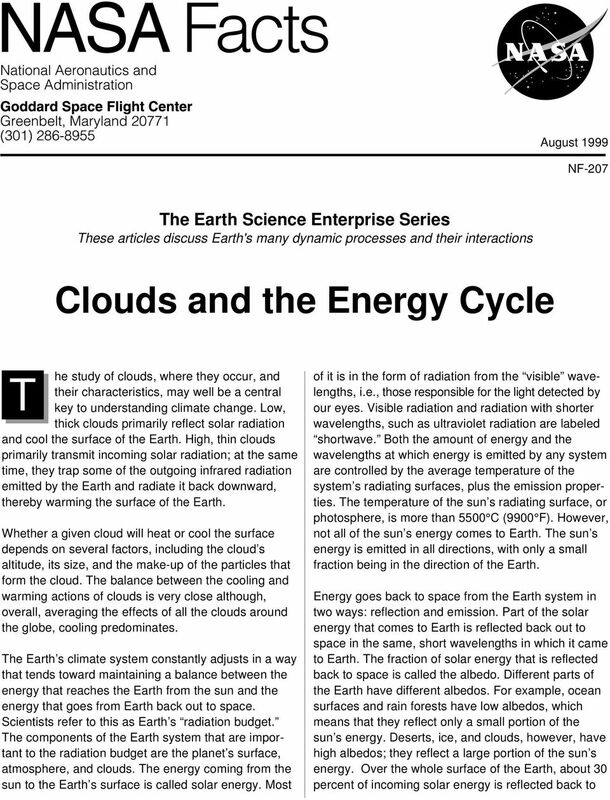 NASA Missions to Study Clouds and the Energy Cycle Studies of clouds and the energy cycle have been performed for many years as part of a number of NASA missions. 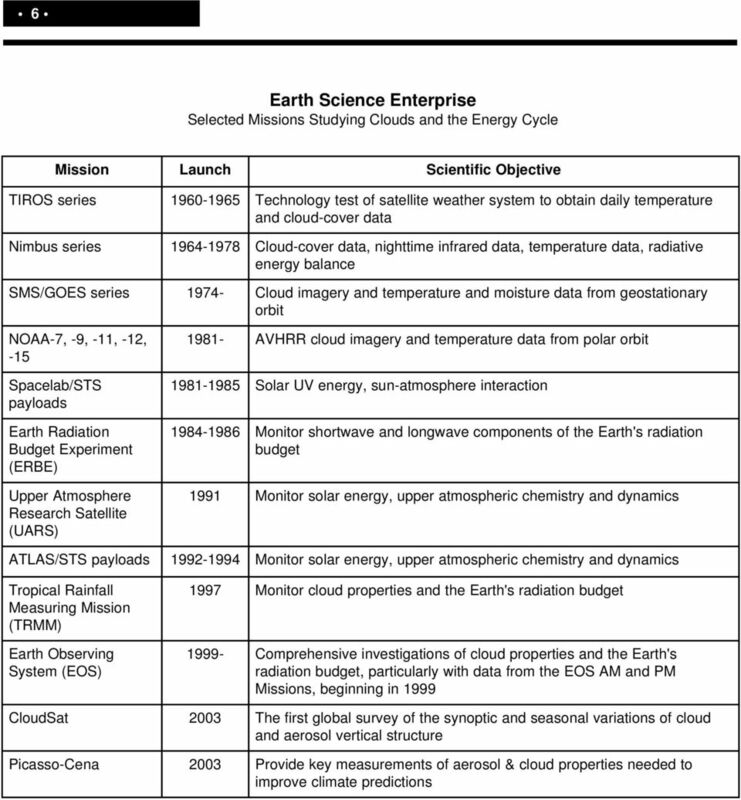 In the near future, small missions addressing specific investigations are planned, leading up to the main initiative of NASA s Earth Science Program, the Earth Observing System (EOS) series of satellites beginning in Some of these missions are listed in the accompanying table. Historically, the Television Infrared Observation Satellite (TIROS) series provided a technology test to obtain daily temperature and global cloud-cover data. The Nimbus series provided the first global radiation budget analysis from space, indicating that the planetary albedo was lower and the outgoing infrared radiation higher than previously believed. 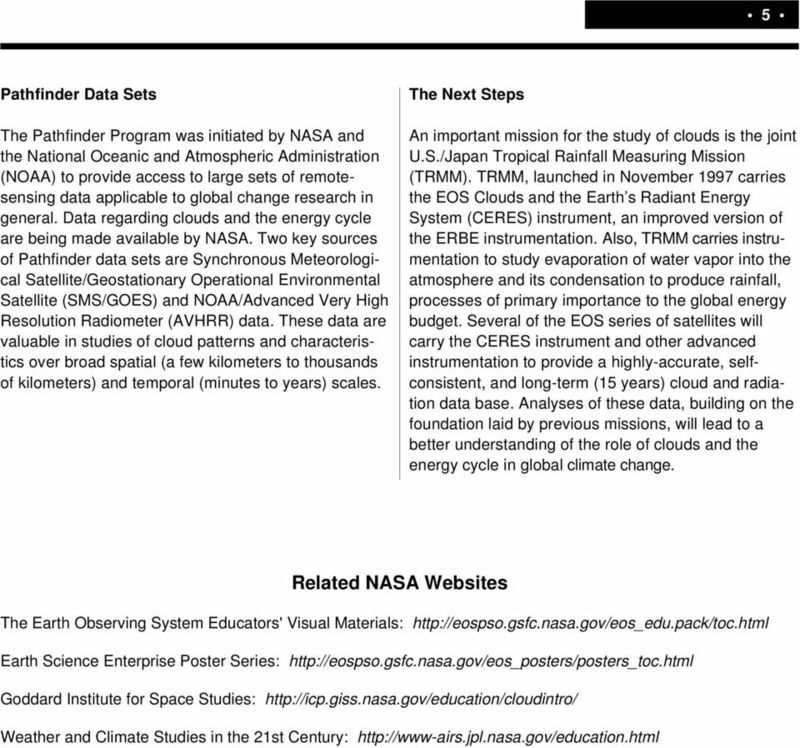 The Earth Radiation Budget Experiment (ERBE) provided an improved and more-comprehensive analysis of the global radiation budget and, especially, the first global observations of cloud greenhouse and albedo forcings. The Upper Atmosphere Research Satellite (UARS) monitors the solar energy reaching the Earth and provides data on upper atmospheric chemistry and dynamics. The early Spacelab/Space Transportation System (STS) and the Atmospheric Laboratory for Applications and Science (ATLAS) payloads launched on the Space Shuttle provided data on solar energy, sun-atmosphere interactions, and upper atmospheric chemistry and dynamics.